"Western Church" redirects here. For Christianity in the Western world, see Western Christianity. "Latin Christian" redirects here. For the music genre, see Latin Christian music. The Latin Church (also known as the Western Church or the Roman Catholic Church[N 1]) is the largest particular church of the Catholic Church, employing the Latin liturgical rites. It is one of 24 sui iuris churches, the 23 other forming the Eastern Catholic Churches. It is headed by the Bishop of Rome - the pope, traditionally called the Patriarch of the West - with headquarters in the Vatican City, enclaved within Rome, Italy. 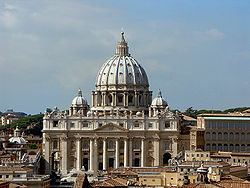 The Latin Church traces its history to the earliest days of Christianity, according to Catholic tradition, through its direct leadership under the Holy See. Substantial distinguishing theological emphases, liturgical traditions, features and identity can be traced back to the Latin church fathers, and most importantly the Latin Doctors of the Church, active during the first centuries A.D., including in the Early African church. After the East-West schism in 1054, in the Middle Ages its members became known as Latins in contrast with Eastern Christians. Following the Islamic conquests, the Crusades were launched in order to defend Christians in the Holy Land against persecution. The Latin Patriarchate of Jerusalem was established for their care, remaining until this day. Other Latin dioceses were vanquished and transformed into titular sees when Christians were forced to convert, flee, or die, going on until today especially around the Islamic world. The Latin Church was in full communion with the Eastern Orthodox Church until the East-West schism. It was spread to Latin America in the early modern period. The Protestant Reformation in the 16th century resulted in Protestantism breaking away. Since 19th century, also smaller groups of Independent Catholic denominations broke away. With approximately 1.255 billion members (2015), it remains by far the largest particular church not only in the Catholic Church or Western Christianity, but in all Christianity. The church is called the Latin Church in most available sources. Especially in an historical context, the church is sometimes also referred to as the Western Church. However, the term of "Roman Catholic Church" is sometimes also used to refer to the Latin Church, for instance when used by Eastern Catholics, but can also be used for the Catholic Church as a whole in some context, such as non-Catholic contexts. Yet, in the strict sense, the term Roman Catholic refers to followers of the Roman rite, which is the predominant of the Latin liturgical rites employed in the Latin Church, contrasting with the liturgical rites of the Eastern Catholic Churches. The 1990 Code of Canons of the Eastern Churches defines the use within that code of the words "church" and "rite". In accordance with these definitions of usage within the code that governs the Eastern Catholic churches, the Latin Church is one such group of Christian faithful united by a hierarchy and recognized by the supreme authority of the Catholic Church as a sui iuris particular church. The Latin rite is the whole of the patrimony of that distinct particular church, by which it manifests its own manner of living the faith, including its own liturgy, its theology, its spiritual practices and traditions and its canon law. A person is a member of or belongs to a particular church. A person also inherits, or "is of", a particular patrimony or rite. Since the rite has liturgical, theological, spiritual and disciplinary elements, a person is also to worship, to be catechized, to pray and to be governed according to a particular rite. Particular churches that inherit and perpetuate a particular patrimony are identified by metonymy with that patrimony. Accordingly, "rite" has been defined as "a division of the Christian church using a distinctive liturgy", or simply as "a Christian Church". In this sense, "rite" and "church" are treated as synonymous, as in the glossary prepared by the United States Conference of Catholic Bishops and revised in 1999, which states that each "Eastern-rite (Oriental) Church ... is considered equal to the Latin rite within the Church". The Second Vatican Council likewise stated that "it is the mind of the Catholic Church that each individual Church or Rite should retain its traditions whole and entire and likewise that it should adapt its way of life to the different needs of time and place" and spoke of patriarchs and of "major archbishops, who rule the whole of some individual church or rite". It thus used the word "rite" as "a technical designation of what may now be called a particular church". "Church or rite" is also used as a single heading in the United States Library of Congress classification of works. Historically, the leadership of the Latin Church (i.e. 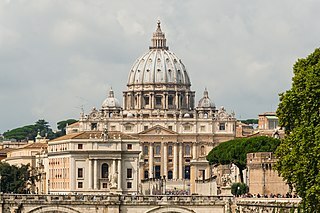 the Holy See) has been viewed as one of the five patriarchates of the Pentarchy of early Christianity, along with the patriarchates of Constantinople, Alexandria, Antioch, and Jerusalem. Due to geographic and cultural considerations, the latter patriarchates developed into churches with distinct Eastern Christian traditions. The majority of Eastern Christian churches broke full communion with the bishop of Rome and the Latin Church, following various theological and leadership disputes in the centuries following the Council of Chalcedon in 451 AD. These included notably the Nestorian Schism (Church of the East), Chalcedonian Schism (Oriental Orthodoxy), and the East-West Schism (Eastern Orthodoxy). The Protestant Reformation of the 16th century saw an analogous schism. Until 2005, the Pope claimed the title "Patriarch of the West"; Pope Benedict XVI lifted this title for ecumenical purposes while continuing to exercise a direct patriarchal role over the Latin Church. The Latin Church is notable within Western Christianity for its sacred tradition and seven sacraments. In the Catholic Church, in addition to the Latin Church directly headed by the Pope as Latin patriarch, there are 23 Eastern Catholic Churches, self-governing particular churches sui iuris with their own hierarchies. These churches trace their origins to the other four patriarchates of the ancient pentarchy, but either never historically broke full communion or returned to it with the Papacy at some time. These differ from each other in liturgical rite (ceremonies, vestments, chants, language), devotional traditions, theology, canon law, and clergy, but all maintain the same faith, and all see full communion with the Pope, as Bishop of Rome, as essential to being Catholic as well as part of the one true church as defined by the Four Marks of the Church in Catholic ecclesiology. The approximately 16 million Eastern Catholics represent a minority of Christians in communion with the Pope, compared to more than 1 billion Latin Catholics. Additionally, there are roughly 250 million Eastern Orthodox and 86 million Oriental Orthodox around the world. Unlike the Latin Church, the Pope does not exercise a direct patriarchal role over the Eastern Catholic churches and their faithful, instead encouraging their internal hierarchies separate from that of the Latin Church, analogous to the traditions shared with the corresponding Eastern Christian churches in Eastern and Oriental Orthodoxy. Several forms of the Latin rite have always existed, and were only slowly withdrawn, as a result of the coming together of the different parts of Europe. Before the Council there existed side by side with the Roman rite, the Ambrosian rite, the Mozarabic rite of Toledo, the rite of Braga, the Carthusian rite, the Carmelite rite, and best known of all, the Dominican rite, and perhaps still other rites of which I am not aware. Today, the most common Latin liturgical rites are the Roman Rite (either in its ordinary form, the post-Vatican II Mass of Pope Paul VI officially authorized for present-day use, or in an extraordinary form such as the Tridentine Mass); the Ambrosian Rite; the Mozarabic Rite; and variations of the Roman Rite (such as the Anglican Use). The 23 Eastern Catholic Churches share five families of liturgical rites. The Latin liturgical rites, like the Armenian, are used only in a single sui iuris particular church. Canon law for the Latin Church is codified in the Code of Canon Law, of which there have been two codifications, the first promulgated by Pope Benedict XV in 1917, and the second by Pope John Paul II in 1983. In the Latin Church, the norm for administration of confirmation is that, except when in danger of death, the person to be confirmed should "have the use of reason, be suitably instructed, properly disposed, and able to renew the baptismal promises", and "the administration of the Most Holy Eucharist to children requires that they have sufficient knowledge and careful preparation so that they understand the mystery of Christ according to their capacity and are able to receive the body of Christ with faith and devotion." In the Eastern Churches these sacraments are usually administered immediately after baptism, even for an infant. Celibacy, as a consequence of the duty to observe perfect continence, is obligatory for priests in the Latin Church. Rare exceptions are permitted for men who, after ministering as clergy in other churches, join the Catholic Church. This contrasts with the discipline in most Eastern Catholic Churches. 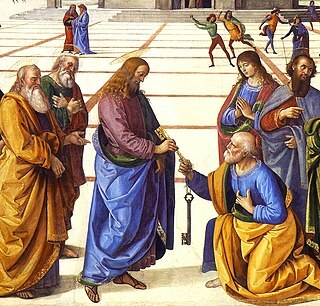 In the Latin Church, a married man may not be admitted even to the diaconate unless he is legitimately destined to remain a deacon and not become a priest. Marriage after ordination is not possible, and attempting it can result in canonical penalties. At the present time, Bishops in the Latin Church are generally appointed by the Pope on the advice of the various dicasteries of the Roman Curia, specifically the Congregation for Bishops, the Congregation for the Evangelization of Peoples (for countries in its care), the Section for Relations with States of the Secretariat of State (for appointments that require the consent or prior notification of civil governments), and the Congregation for the Oriental Churches (in the areas in its charge, even for the appointment of Latin bishops). The Congregations generally work from a "terna" or list of three names advanced to them by the local church most often through the Apostolic Nuncio or the Cathedral Chapter in those places where the Chapter retains the right to nominate bishops. ^ The term Roman Catholic Church is also used to refer to the Catholic Church as a whole in some contexts, especially in a non-Catholic context. ^ Marshall, Thomas William (1844). Notes of the Episcopal Polity of the Holy Catholic Church. London: Levey, Rossen and Franklin. ^ "The Pontifical Yearbook 2017 and the "Annuarium Statisticum Ecclesiae" 2015". press.vatican.va. Retrieved 1 April 2019. ^ "Catholic Churches". Melkite Greek Catholic Church Information Center. 8 August 2009. Retrieved 12 October 2017. ^ "CCEO, canon 27". w2.vatican.va. Retrieved 1 April 2019. ^ "Code of Canon Law, canons 383 §2". www.vatican.va. Retrieved 1 April 2019. ^ "Glossary of Church Terms". usccb.org. Retrieved 1 April 2019. ^ "Library of Congress Classification - KBS Table 2" (PDF). loc.gov. Retrieved 1 April 2019. ^ a b Fortescue, Adrian (1913). "Latin Church" . In Herbermann, Charles (ed.). Catholic Encyclopedia. New York: Robert Appleton. ^ Rowland, Tracey (2008). Ratzinger's Faith: The Theology of Pope Benedict XVI. Oxford University Press. Retrieved 24 November 2017. ^ "Codes of Canon Law - The Holy See - Archive". www.vatican.va. Retrieved 1 April 2019. ^ "Code of Canon Law, canon 889 §2". www.vatican.va. Retrieved 1 April 2019. ^ "Code of Canon Law, canon 913 §1". www.vatican.va. Retrieved 1 April 2019. ^ "Code of Canons of the Eastern Churches, canons 695 §1 and 710". w2.vatican.va. Retrieved 1 April 2019. ^ "Code of Canon Law, canon 277 §1". www.vatican.va. Retrieved 1 April 2019. ^ "Anglicanorum coetibus, VI §§1-2". w2.vatican.va. Retrieved 1 April 2019. ^ "Code of Canon Law, canon 1042". www.vatican.va. Retrieved 1 April 2019. ^ "Code of Canon Law, canon 1087". www.vatican.va. Retrieved 1 April 2019. The Eastern Catholic Churches or Oriental Catholic Churches, also called the Eastern-rite Catholic Churches, and in some historical cases Uniate Churches, are twenty-three Eastern Christian particular churches sui iuris in full communion with the Pope in Rome, as part of the worldwide Catholic Church. Headed by patriarchs, metropolitans, and major archbishops, the Eastern Catholic Churches are governed in accordance with the Code of Canons of the Eastern Churches, although each church also has its own canons and laws on top of this, and the preservation of their own traditions is explicitly encouraged. The total membership of the various churches accounts for about 18 million, according to the Annuario Pontificio, thus making up about 1.5 percent of the Catholic Church, with the rest of its more than 1.2 billion members belonging to the Latin Church, also known as the Western Church or the Roman Catholic Church. Traditionalist Catholicism is a set of religious beliefs made up of the customs, traditions, liturgical forms, public and private devotions, and presentations of the teaching of the Catholic Church before the Second Vatican Council (1962–65). It is associated with an attachment to the pre-1970 Roman Rite Mass, referred to as the Traditional Latin Mass. The Catholic Church has engaged in the modern ecumenical movement especially since the Second Vatican Council (1962-1965) and the issuing of the decree Unitatis redintegratio and the declaration Dignitatis humanae. It was at the Council that the Pontifical Council for Promoting Christian Unity was created. Before that time, those outside of the Catholic Church were categorised as heretics or schismatics. The priesthood is one of the three holy orders of the Catholic Church, comprising the ordained priests or presbyters. The other two orders are the bishops and the deacons. Only men are allowed to receive holy orders, and the church does not allow any transgender people to do so. Church doctrine also sometimes refers to all baptised Catholics as the "common priesthood". This is a glossary of terms used within the Catholic Church. A particular church is an ecclesiastical community of faithful headed by a bishop, as defined by Catholic canon law and ecclesiology. A liturgical rite depends on the bishop.